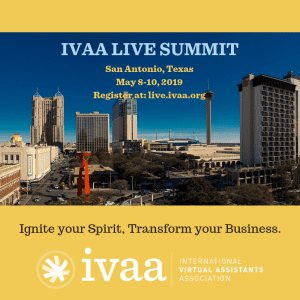 The International Virtual Assistants Association is pleased to offer you an opportunity to locate the products and services that you need from the best VAs in the business. VAs are fellow business owners, like yourself, looking to form partnerships with fellow business owners. Please keep that in mind as you prepare and submit your request for proposal. Download this PDF “How to Submit a Request for Proposal to Get the Optimum Responses” for some suggestions on what to include in your RFP. Type in the required contact information in the form provided. Give a concise detailed description of your needs. NOTE: Responses will be emailed directly to you from our members. If you do not wish to receive phone calls or prefer a fax instead, please state so in the description. Please be courteous and acknowledge any responses received. Both parties are responsible to perform due diligence in this process. IVAA does not make any claims as to the validity of either party in this RFP process. IVAA is not responsible for how each party represents themselves. We are here to provide a venue for clients to connect with VAs. Please note: RFP’s accepted are for paid VA roles only. This form is ONLY for submitting RFP’s, please do not post here if you are a Virtual Assistant looking for work. Your submission will be deleted. If you have any questions or problems or need to withdraw or extend your RFP, please contact the Request for Proposal Coordinator. Brief description of request, such as "Administrative Services" or "Web Design"
We recommend limiting this posting to 2 weeks. Your posting will expire on this date.